At the heart of black Perigord, La Fage Estate is the ideal place to relax in a region that is surrounded with history and prehistory (many caves including the cave of Lascaux, troglodyte villages, Cro-Magnon man’s house and many more), all of this in a diversity of landscapes, a rare art of living and preserved authenticity. In the middle of the estate’s 55 hectares (550.000 m2), you will discover true tranquillity, the one we all seek during our vacation. Your evenings will sparkle and the vault of heaven will fill you with wonder in absolute darkness. Over there, the only visitors you may encounter are deer, stags or does… Nature will fill you with wonder. If you like cycling or walking, numerous trails are accessible from the estate. Besides, on your way, you will have the chance to discover several types of mushrooms such as ceps, chanterelles and… truffles. 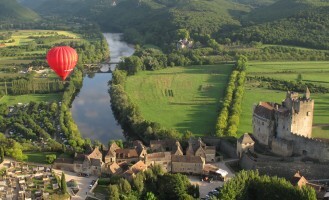 The La Fage Estate is located at equal distance between Sarlat-la-Caneda, Perigueux or Bergerac with its international airport (30 to 40 minutes). Besides, in less than 10 minutes, you will be in Bugues where you will find restaurants, bakeries, shops and supermarkets. Its Tuesday’s market is not to be missed! 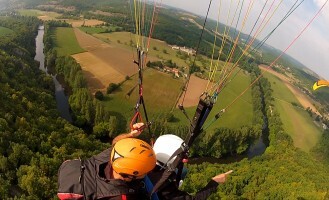 Throw in the added attraction of the Dordogne and the Vezere (less than 10 minutes away from La Fage) which will delight the children and where you will experience memorable kayak rides downriver. The La Fage Estate has several buildings (including a small chapel for your weddings). They will provide you with total privacy. 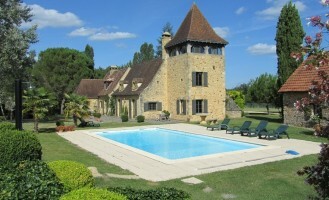 You can rent the whole property or a single gîte. (Please do not hesitate to contact us for more information.) Don’t forget to bring your rackets for tennis. You will enjoy our magnificent court in the forest. • Bedroom Beygnac: Additional room with comfortable double beds sofa.